After the revolutionary 1960s did not abolish capitalism, it was evident that dominant forms of revolutionism had failed. 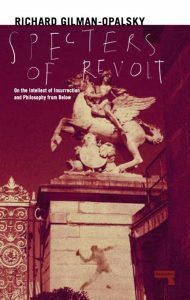 Richard Gilman-Opalsky approaches the needed rethinking by vindicating both the necessity and the rationality of revolt, and viewing it as a kind of “philosophical activity from below.” He stresses the need to be less ideological and more philosophical–less tied to preconceived ideas and more open to rigorous rethinking based on actually listening to revolt from below. His book interrogates numerous unorthodox radical writers, such as Raya Dunayevskaya, Michel Foucault, and Guy Debord. ← Chicago meeting: #MeToo, Women’s Marches: Where do we go from here?